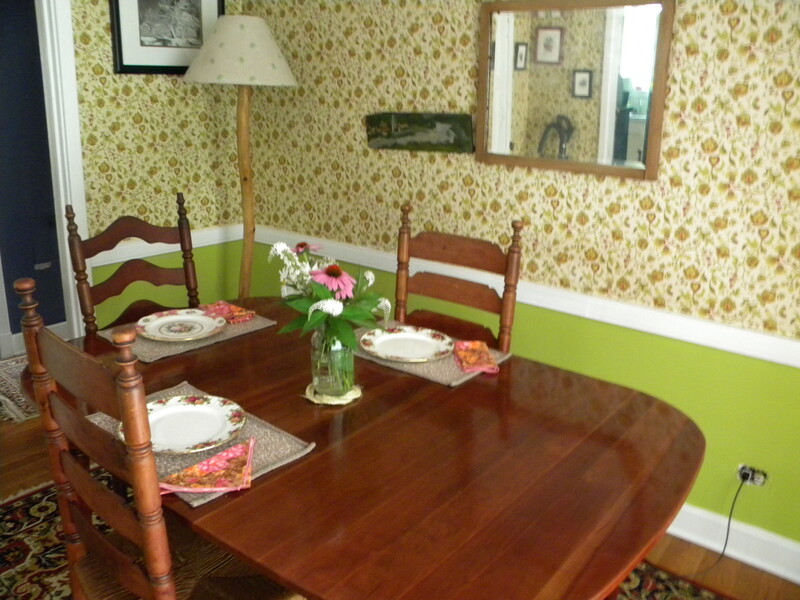 After fourteen years of being put off and a month of living in a mess, the dining room is DONE. Alright, so there are still some little details to be addressed, like painting the radiator, swapping out the outlets (as recommended by the inspection when we bought the house), replacing the outlet covers and finishing the the french doors. But these are things that can happen with the room back in use. Right here I want to pause and sing the praises of my dear husband. Not only was he a trooper about me heading out to Lowe’s for some drop cloths and walking in the door with a new ceiling fan for him to install, he took some time off work and knocked out what he wanted to see done – fixing the shoe moulding to be on the floor and not floating half an inch above where it was during the shag carpet days, as well as peeling, scraping and putting the first skim coat on the ceiling. He fixed the door jamb where I told Will Smiley to take the door down during a dinner party back in the stone ages before we had Edie (and Will had met his wife Mollie). He was an even bigger trooper for putting up with my “Well, I put a skim coat on this morning and then while it was drying, went to the pool and Edie wanted to stay all day long and we ran into this person & that person and I meant to get home before dinner, but I didn’t. And now I’m too tired to work on the dining room, I’ll do it first thing in the morning” approach. But what I really want to publicly thank him for is the Sunday in which I not only did the final sanding of the ceiling, I wiped the entire room down and got it ALL primed. He was gracious enough to spend that entire afternoon at the pool with Edie, ordered my favorite Indian food for takeout and walking in the door with dinner, also had in his hand what I had designated as the ‘official’ beer of the dining room renovation, placing an open cold one in my very tired & grumpy hand. So, three skim coats on the ceiling, a coat of primer on everything, three coats of paint on the walls and the trim to cover up the past deep red & avocado colors and we were finally done. I spent a day cleaning the floors, shaking out the rug and wiping down the furniture with lemon oil before spending yesterday moving things back into place and unpacking. Funny how even the vacuum found it’s way into it’s usual spot. I think it missed it’s corner. And it really sort of blends in with the new color, doesn’t it? After painting a few sample colors and realizing none of them worked, I pulled out my Sherwin Williams fan deck from my days specifying paint colors for a living and picked a new color. I marched into the Sherwin Williams store, paused to take a look at some of the sample chips, grabbed one, realized it was the one I had already decided upon before leaving my house, took that as a sign and went for it. “Parakeet” is the color. 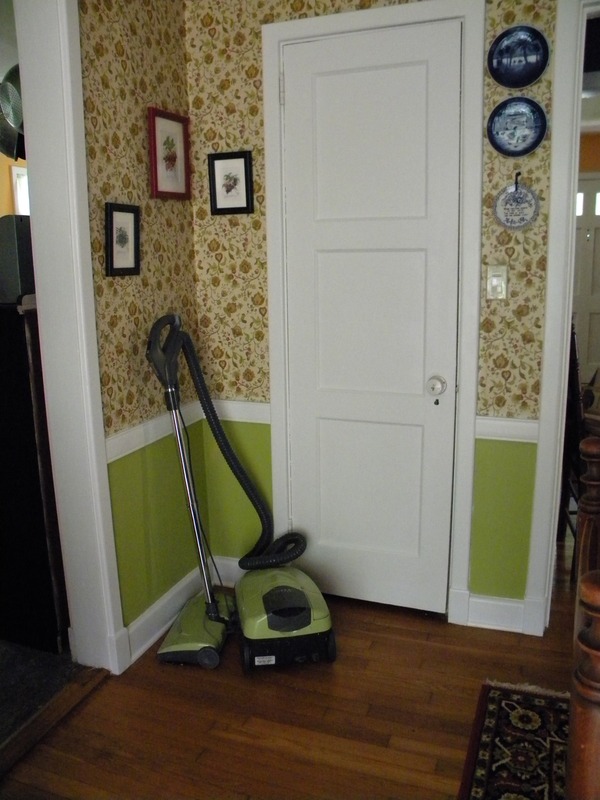 It matches the wall paper and is just the right shade of green to add some color and light to the room. Edie & I both think the room feels bigger, even if it’s not. It also appears much lighter than when it was red. But that might also be the effect of having a WHITE ceiling now, rather than a formerly white, now stained and sort of creme colored ceiling. What a difference a coat of paint makes. Or three as the case may be. The hutch found itself quite heavily edited during the unpacking. I realized I had an entire box of Christmas items stored in there that didn’t need to be stored in there. Among other things. I also want to stop here and give a huge thanks to Joe, who came over on a day’s notice and helped Pat install the fan. We sat under it as we ate dinner last night and it was such a huge improvement over how the room used to be. Air circulation is a wonderful thing. For our first celebratory meal in the new room, I broke out the china last night. Why have three sets of china taking up space if you’re not going to use it, right? There was also an incident involving another squirrel break in. I came home from market Saturday to notice there had been a break in. 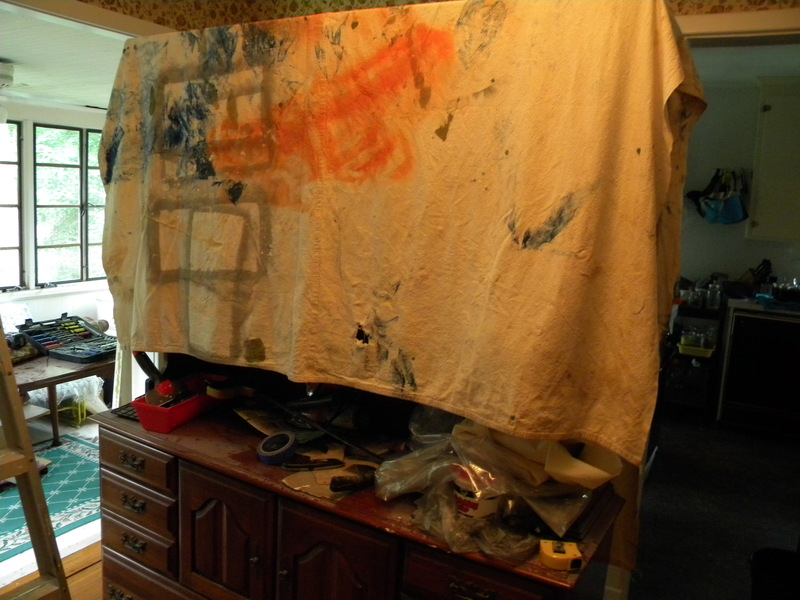 I went about my business when suddenly I heard a noise that sounded like it was coming from the tarp covered hutch. Turns out there was a squirrel who not only broke in, but gave itself a tour, making itself at home, nibbling on the bread I bought to ‘clean’ the wallpaper. Yes, I know Willdean, that I need to just start shooting the suckers. As for the bread ‘cleaning’, I did a google search on cleaning old wallpaper. 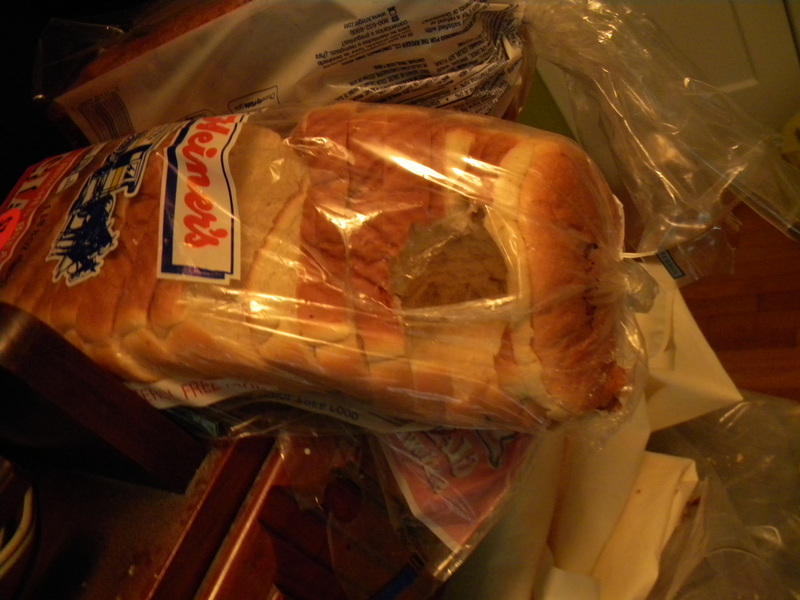 Several sites recommended balling up white bread and rolling it over the paper. It sort of crumbles while you’re doing it, so there’s quite a mess to clean up following. But it does work and it made an improvement. 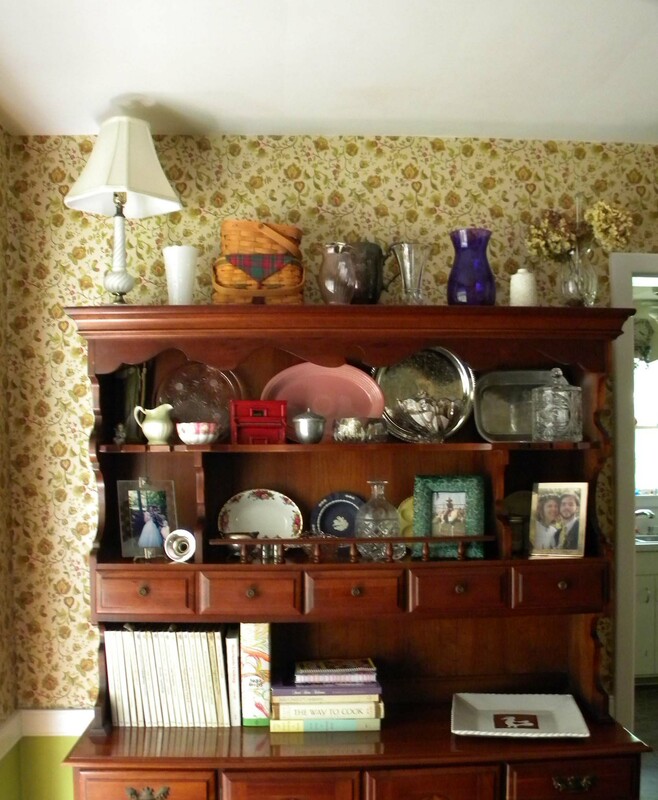 Now that the dining room is done, there are a number of smaller projects to be tackled – including cleaning the rest of the house up from the destruction that occurred during the renovation. Prime canning season is under way and I am more than happy to have my auxiliary counter space back. After putting up 10 pounds of blueberries and 15 pounds of cherries last week without it, I’m looking forward to being able to spread out for my next few canning projects. Up next, pickled peaches. Nice work. The walls look terrific. Thanks for explaining the bread/wallpaper thing because it was going to be the first thing I asked! I know, it sounds crazy, but it worked! It’s apparently the 1830’s method of cleaning. It looks fantastic! That color with the white trim makes the room look so fresh! Squirrels kind of scare me. Inside a house, they would REALLY scare me. I screamed that squirrel around the house and out the door, I assure you. Woke my poor husband up! Thank you for making that room shine. You are very welcome. Thank you for the help. And putting up with it. Me too. I realized it was the color I had envisioned it to be for oh, a good 13 years or so. Congrats! 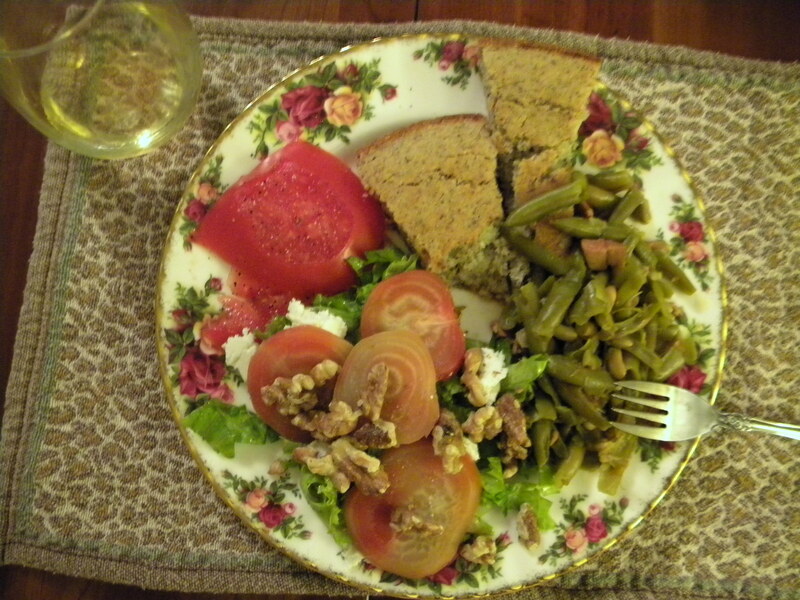 I’m hungry enough to yank that plate of food from the screen and start to gobble- lookin good. The green looks great with the wallpaper. You must be so happy!